Harness Racing is one of the oldest type of horse races. People have bet on this type of race since the Roman chariot races. Modern harness racing may not be as dangerous as Roman races, but they have only exploded in popularity since early times. Harness racing is different from the more well known “flat” racing in a number of ways. Some harness races are run with the horse under saddle, but the majority are not. The horses are hitched to a wheeled cart, and must run the race at a specific gait. There is no difference in how a bettor would place bets on a harness race, however. The only restrictions on what bets can be placed vary on the track. The carts used for these races is a very small, lightweight cart. The cart is called a “sulky” and these are very small two wheeled carts made for only one person, the driver. Current sulkies are extremely light. The restrictions on these carts are very exacting. The sulkies may only be made of certain materials. Racing sulkies are even lighter than the training sulkies. They are designed to be as fast and aerodynamic as possible to give the driver the most advantage during the race. Even just sitting on these sulkies requires skill as there is only a very small seat for the driver to balance on. Harness racing in North America is restricted to Standardbred horses. However in Europe other gaited breeds are allowed, and there are even specific races for other gaited breeds. Gaited horses are preferred for harness racing because of how fast and smooth thier gait is. Many unfamiliar with the sport assume that “forcing” this gait is unnatural, and they are incorrect. While all horses can trot, only a few special breeds have the genetic ability to “gait”. The hobbles placed on the racing horses do not force the gait, they only discourage breaking into a run. Breaking into a run forces the driver to pull the horse outside the race until they resume the gait. Harness races can be raced on the the same racetracks as flat races, however there are racecourses specifically designed for harness racing with banked corners and no inner rail for safety reasons. The lack of an inner rail allows the driver to pull the horse and sulky out of the way, and lessens the ability to “box” in opponents. 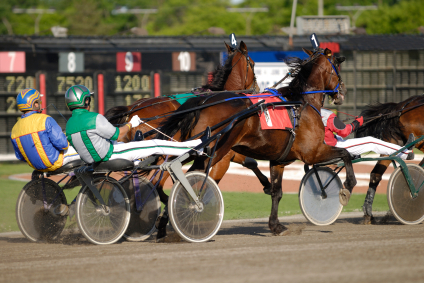 Harness races also typically start behind a motorized gate for a pacing start in North America while other countries prefer a standing start. The motorized start brings the horses up to the start line slowly to allow all the horses to begin the race at the required gait before pulling out of the way. The usage of whips in harness racing varies. The whip is used to signal the horse either by tapping them on the rump or striking the side of the sulky. Some countries have banned whips altogether.